Gillie Brogues are the most popular of all the kilt shoes! Gillie Brogues are the most popular of all the kilt shoes, and just so there is no confusion, they are also often spelt with the alternative spelling Ghillie Brogues. They are without doubt the most comfortable pair of shoes you could ever wear, and the major reason for their incredible comfort is the fact that unlike a normal shoe, they don't have a tongue. 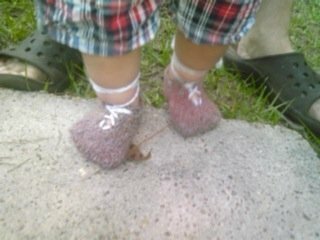 The reason for this, is that they were developed to be worn for walking over the Scottish peat bogs, and without a tongue the shoes would dry much faster than a normal shoe. The pattern of holes typical on these kilt shoes also sets them apart from other shoes, and although nowadays the holes are purely for decoration, originally the holes went right through the leather, which allowed for rapid drainage when wet. They were low-heeled, and made from heavy untanned leather. They are tied with long laces, which lace up the shin, that meant that when your foot sunk into the wet peat, you could pull it out and the shoe would remain on your foot rather than getting stuck in the peat bog. Ghillie Brogues are nowadays normally worn as evening wear, with your kilt being worn with a Prince Charlie jacket. They are generally considered to formal to be worn as day wear. The word Brogue is derived from the Gaelic word "Brog" meaning shoe, and the word Gillie is a term for a shooting and fishing guide, both in Scotland and Ireland. In America, Brogues are often called wingtips, as the pattern of holes on the toe cap form the shape of the letter W, and resembles the profile of spreading bird wings. One visitor to the web site, Erin, was so taken with gillie brogues that she decided to knit a pair for her son Liam, you can see the excellent results below. 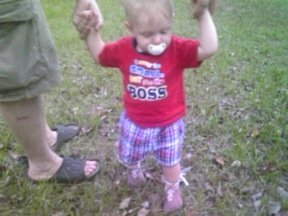 And here he is practicing his walking skills in the shoes his mother described to me as the prototype. I would like to thank Erin for kindly sending me these wonderful photos. If you would care to see a photo of my Gillie Brogues, then please go to the kilt shoes page, where you can read about the different shoes which are worn with kilts. If you would like any further information on these shoes, then drop me a line using the Contact Us page, and I will be only to happy to help.